Welcome to Ladybug Designs! Please browse the shop and contact me if you need any help, have any queries or would like to discuss your themes and ideas. Invitations are the very first impression of your wedding that your guests receive and Ladybug Designs is here to ensure the very best! Every wedding is unique which is why I offer a bespoke service free of charge to help co-ordinate your stationery. Each bespoke design is carefully handmade which means that colour schemes and your own ideas can be incorporated. Just contact me with ideas and requests I will reply to discuss and confirm details, your choice of font and wording. I also make handmade wedding save the date cards, thank you cards, as well as all the stationery needed on the big day including table plans, place cards, letter boxes. I can also source table decorations for you and help with the little details. Because I provide a bespoke service, I also design and make invites and stationery for other events such as Birthdays, dinner parties, baby announcements and Bar Mitzvahs. As an internet based business, I can offer my services easily, where ever you are. I have made invitations for couples all over the world, who, I am sure would gladly recommend me ;) I have worked for couples in the USA, Canada, Australia, Italy and France to name a few. For a completely stress free time I can either print envelopes ready for you to post straight away, or I can send the invites individually from my studio. (A small fee is added, along with the cost of postage). Please browse the site to get some inspiration! If you have something in particular in mind, or see a few designs you would like to combine - just let me know! I am super friendly and efficient so please don't hesitate to contact me to discuss your invitations! 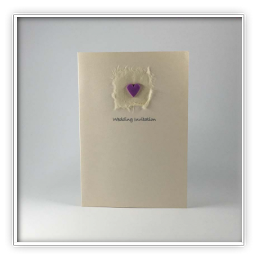 handmade wedding invitations, bespoke wedding invitations, invitation wording, handmade and bespoke invitations for your wedding, handmade invitations, invitations and stationery, and wedding stationery! However you like your wedding invitations and stationery, Ladybug Designs can get it just right for you without being costly and without compromising quality. Please browse our galleries and do contact us with any questions. Courtesy of Rebecca Black of Etiquette Now! Wedding invitations can be made by word of mouth, by telephone, or by email. The main objective is to make sure that guests know the who, what, when, and where of the event. And although wedding invitations are much the same as any other invitation, they are more than just a simple invitation; they are a visual statement before the guest even reads the words. They convey the formality and tone of your event through the formality of the paper, letter font, and style; the more formal your wedding, the more formal the wedding invitations. So it follows proper etiquette, that for a formal wedding you wouldn’t invite your guests via email, phone, or word of mouth. 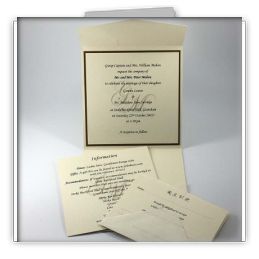 Formal wedding invitations are printed on heavyweight ivory, cream, or white paper using a classic letter style such as Roman. These are usually engraved and traditionally written in the third person style. If your wedding is informal, you are free to customize your unique wedding invitations with more informal language and style. Note – Wedding Invitations: If you choose to invite guests for informal weddings via email, it is best to list a land address for those uncomfortable with email. Typically the bride’s parents would issue the unique wedding invitations, because traditionally they would host their daughter’s wedding. However these days, more and more couples are paying for their own weddings or the costs are split so everyone can help the couple in the best way possible. The reasoning behind couples paying for their own wedding is logical and fair. Today’s couple is more financially able to cover the costs. No longer does the bride live at home, taken care of by her father, until the day she marries someone who can then take care of her. Women take care of themselves--they should contribute. Usually, wedding invitations will suggest who is considered the host; the host issues the invitation. Although, it is not incorrect to use the traditional style when the couple is covering the entire cost of the wedding; some wish to use this style out of respect for their parents and tradition. A wedding day is a special celebration so the bride and groom with their families make many preparations ahead of time. The initial planning for the ceremony and the reception starts months ahead of time in order to have the proper reservations. Shopping for the dress and arrangements for the tuxedoes start early and can take many hours. Bakers make lots of delicious cakes, but these must be ordered in advance. When all the arrangements are fixed, the invitations should be sent out with all the information for the guests. The invitations are the first word of the wedding celebration for many friends of the bride and groom. Most people recognize a wedding invitation when it arrives because these documents are usually similar. A handmade wedding invitation can be the first sign that this will be a special wedding with the bride and groom taking care of every detail. A handmade wedding invitation will be different from the typical invitation that arrives in the mail. The wedding invitation could be made personally by the bride, the groom or both. A handmade wedding invitation could be made by an artist commissioned by the couple. A handmade wedding invitation is not created with one decision. There are many elements in a handmade wedding invitation. First of all, the creator of the handmade wedding invitation should decide on the wording to be placed in the invitation. All of the arrangements previously made for the reception and the ceremony need to be shared with the guests. 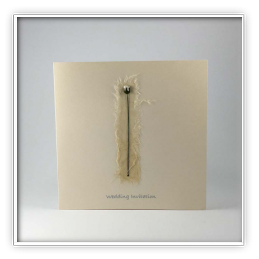 The bride and groom will decide who will write the wording on the handmade wedding invitation. The next step will probably be a decision about the paper which will be a distinctive paper for an important event. The types of paper and the available colors are numerous so all possibilities should be carefully considered. A couple choosing a handmade wedding invitation needs to include the important elements often done by a printer used to doing wedding invitations. A bride and groom do not send out wedding invitations daily like the printer, but they need to get information out and back in order have a smooth wedding ceremony and reception. The printer will include envelopes and response cards, and the couple making handmade wedding invitations should make sure they do not forget any of these important elements. 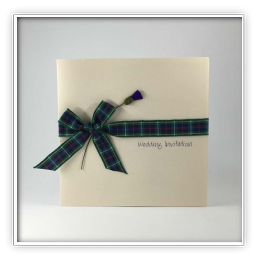 Ladybug Designs can help you with creating the perfect wedding invitations, handmade invitations, bespoke wedding invitations, wedding invitations & stationery, and handmade and bespoke invitations for your wedding. A wedding invitation is a letter asking the recipient to attend a wedding. It is typically mailed four to six weeks before the wedding date. Wedding invitations may be printed using one of the following methods: engraving, lithography, thermography, letterpress printing and sometimes blind embossing. 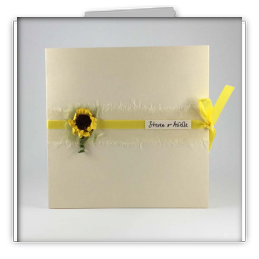 They can also be ordered from an artist specializing in handmade cards and invitations, or for the artistically inclined can be handmade. Making handmade wedding invitations has become increasingly popular due to the rise in popularity to the cardmaking and scrapbooking craft hobbies. Most of the time, wedding invitations are mailed in double envelopes. The inner envelope may be lined, is not gummed, and fits into the outer envelope. The outer envelope is gummed for sealing and addressing. Traditionally, the mother of the bride addresses the wedding invitations. However, if she chooses not to, the mother of the bride may outsource this responsibility to a professional calligrapher or a friend with good penmanship. Along with the wedding invitation, the ensemble may also include a response card and envelope. The response card is traditionally used for gathering totals for the caterer and getting a general number of guests attending. The recipient is asked to mail back the response card roughly two weeks before the wedding or by the date indicated. The envelope is pre-addressed and pre-stamped by the wedding party for ease. Other pieces often included in the ensemble are the reception card or folder, map or direction card, and accommodation information. The reception card simply lists the addresses and times of any post-wedding events, such as a cocktail hour, dinner or dance. Map or direction cards provide details about the location of the wedding and reception. The accommodation information gives helpful tips about airfare, transportation or hotel arrangements for out-of-town guests. Local attractions may be featured as well. Often the accommodation information is sent in advance with the save the dates. A save the date is similar to an invitation and is mailed up to one year before the wedding date. Save the dates simply announce that the wedding date has been set and encourages recipients to plan for the event. It is not used as a substitute for the wedding invitation and typically mentions that an invitation will follow. The save the date can also allow you to let guests know what area of the country the wedding will be held. Everybody talks about wedding invitations, but what about all the other terms and items that are associated with them. Below are explanations of some of the more common terms and items that you’ll probably encounter while shopping for your invitations. Seal n Send Invitations: This type of invitation is mailed to guests as a single-folded piece (without an envelope) having the respond postcard attached to the invitation by a perforation for easy removal. Since the respond piece is a postcard, you will save on postage for the return mailing. 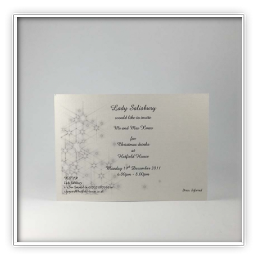 Prices for this product normally include seals along with a printed return address on both the back flap when initially mailing the invitation and on the perforated respond postcard. Announcements: For those who won’t be invited to your wedding but you would still like them to know about your marriage, you can mail them an announcement card. They can be printed on the same paper as your invitation but mailed on your wedding day or immediately after with the wording stating that your wedding has already taken place. Reception Cards: If there isn’t enough room on your invitation for listing the details of your reception or if not all guests will be invited to attend the reception, reception cards can be ordered to match your invitations and then be included as a separate insert. Please keep in mind that this card could possibly add to your mailing cost since postage is based on weight. RSVP Cards: These cards are essential to planning for your dinner/reception since an accurate guest attendance count will be needed for food and seating preparations. 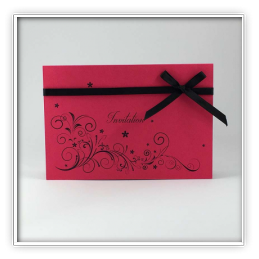 The respond card along with its mailing envelope will be inserted with your invitation. Remember to include a postage stamp on this small envelope which will also have a mailing address already printed on it so all your guests have to do is fill out the card and mail it back by the date you have printed on it. Map Cards: These direction cards would be included as a convenience for any guests who might not be familiar with the location of the church and/or reception. Printed Invitation Envelope Flaps: This option of having your return address printed on the outside envelope can save you valuable time and ensure that undeliverable invitations are returned to you. There is a small cost involved but it also gives an address to those who might not be able to attend but still want to send you a card or gift. Lined Inner Envelopes: For a small charge, you can request your inner envelopes have a colored lining to add a special touch to your invitation ensemble. Color choices will vary depending on the invitation style you choose. Envelope Seals: These self-adhesive labels add just the right finishing touch. 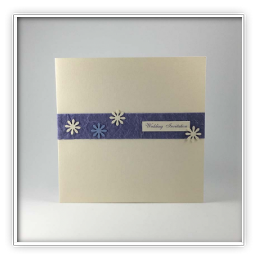 They are available in many styles and are used on your outer envelope making it look like they are holding the flap down even though it has already been sealed. 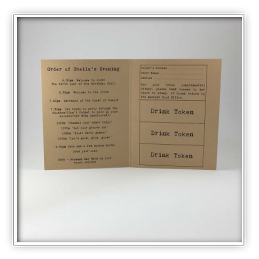 Informal Notes: These are used separately from your invitations but should be included with your original order since they are usually printed on matching paper and this will save you on shipping costs. They are personalized with either your names or monogram on the front with the inside being blank for writing your thank you notes. Any leftovers can be used long after the wedding for other purposes. Blank mailing envelopes are included with them. Not all of the above items are necessary to make your wedding invitations complete. Remember, this is your special day, so it’s your decision as to which ones you would like to include as part of your invitation ensemble.